Thomas King and Glenn Reynolds for reviewing prior to publication. 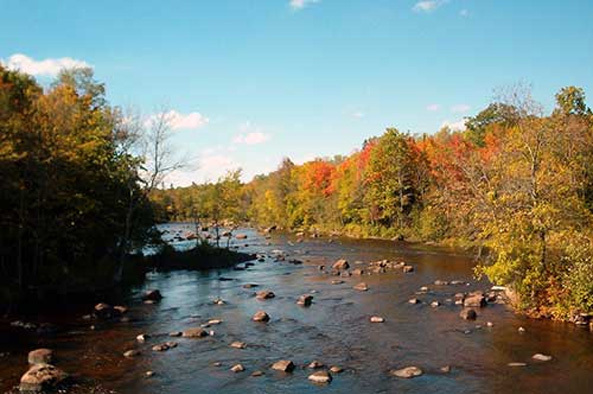 A proposed underground zinc and copper mine threatened the waterways of the Menominee, Sokaogon Chippewa, and Potawatomi in northeastern Wisconsin. As planned, the massive Crandon Mine would have produced 44 million tons of toxic waste at the headwaters of Wolf River, which would destroy traditional rice gathering and religious places around the mine project area including Swamp Creek, known in Ojibwe as Mushgigagamongsebe (The Little River of Medicines), and Rice Lake which is located in the heart of the Sokaogon Reservation only two miles downstream from the proposed mine. Robert Van Zile, a Sokaogon pipe carrier, says, “Water is necessary for life, metals are needed for wealth — which is more important? I will not sit back and let corporate greed rob our future generations of their rights to have access to pure water.” A major victory for sacred land was achieved in October 2003, when the Sokaogon and the Potawatomi collaborated to purchase the land and withdraw the mining application. Protecting the purity of water in underground aquifers and surface streams is a deep spiritual responsibility held by the Sokaogon Chippewa and other native people in the area. According to Sokaogon beliefs, all water flowing on and under the ground is connected, and constitutes the lifeblood of Nookomis oki, Grandmother Earth. The Wolf River, its watershed, and the surrounding hill country have been used by generations of Sokaogon peoples for activities that pass on traditions and sustain their community’s identity. These activities include religious observances at Popple Pond and Oak Lake and gathering pure water from springs for use in water ceremonies. The watershed and wetlands sustain the environment upon which Sokaogon culture is based—including collecting medicinal plants, trapping beaver and muskrat, hunting deer, berry-picking and maple-sugaring. The Mushgigagamongsebe watershed supports manoomin (wild rice), which northern Wisconsin’s native people have harvested for centuries. The name “Menominee” or “Omaeqnomenewak” means Wild Rice People. Rice Lake has for generations been a central place for rice gathering and today is virtually the only lake in the vicinity that produces an abundant rice crop. The Sokaogon, Menominee and Potawatomi express intense feelings of responsibility for the manoomin of Rice Lake, and their personal and cultural identity is intimately linked with both the rice and the practice of rice harvesting on the lake. Spirit Hill, at the western edge of the Mushgigagamongsebe watershed, is a place of great spiritual, cultural, and historical significance to Sokaogon peoples, and is associated with many traditional ceremonies, including greeting, naming, sweat lodge, and funerary ceremonies. Ancestral village and burial sites in the Mushgigagamongsebe watershed near Rice and Oak Lakes are regarded by Sokaogon people as places that must be protected out of respect for their ancestors. Many early 19th century treaties between the U.S. government and natives of northern Wisconsin provided government access to mineral resources on traditional lands. The first of these treaties was signed in 1827 by the Chippewa, Winnebago, Potawatomi, and Menominee, and permitted lead mining on their land, but was not meant to cede the land itself. In 1837 and 1842, the Ojibwe ceded their remaining territory in Wisconsin for the right to continue hunting, fishing and gathering in their traditional territory. These treaties opened up the land to logging, and resulted in the total loss of native control over resource extraction in the area, until three of the Ojibwe bands were granted permanent reservations in 1854. The Sokaogon were not recognized as a separate band or given a reservation until 1939 when land was purchased around Rice Lake which continues to be one of the most productive wild rice lakes in North America. The exploration for minerals near native lands intensified in the 20th century. In 1975, Exxon Minerals Co. discovered a 55 million ton deposit of zinc and copper sulfide near the town of Crandon, Wisconsin just upstream from the Sokaogon Reservation. The deposit is on a 12-square-mile tract of land that was initially promised to the Sokaogon Chippewa for a permanent homeland during treaty negotiations in the 1800s. The Sokaogon had to wait 85 years before receiving the approximately 3-square-mile Sokaogon Chippewa Reservation which is located to the southwest of the discovered mineral deposit. The much larger Menominee Reservation lies downstream of the mine and depends on the purity of the water to maintain healthy forest lands. In 1986, after a decade of strong opposition from tribes and environmentalists, Exxon formally abandoned plans to mine the zinc and copper deposit. Since then, the mining claim has gone through several corporate owners. After the Australian based BHP Billiton spent years trying to obtain the necessary permits to mine, they sold the land and the mineral rights in April 2003 to the locally-held Northern Wisconsin Resource Group LLC. In June 2003, NWRG asked the state to put its permitting process on hold, an indication that it could not abide by the state’s mining moratorium law, which requires that companies prove they have the expertise to open and close a mine without environmental degradation. The U.S. Environmental Protection Agency (EPA), under the federal Clean Water Act, has been given the authority by Congress to recognize the right of tribes as sovereign nations to regulate the quality of waters on their reservations. In 1995, the EPA granted the right of the Sokaogon Chippewa to set Outstanding National Resource Waters water quality standards which prevents any upstream Clean Water Act permits to be issued for projects which will cause measurable degradation to reservation water resources. The state of Wisconsin filed suit to void the EPA’s grant of Clean Water Act authority to the tribe on the grounds that the tribe had no power to regulate state waters and that the state would do a better job with the task of protecting Wisconsin’s water resources. However, the state’s water quality standards allow water to be degraded in this area if water pollution is necessary for economic development. Twice, most recently in September 2001, federal courts have found that the EPA had sufficient grounds to grant Clean Water Act authority to the tribe and that the tribe had stronger environmental protection regulations than Wisconsin. After the state appealed the second decision to the U.S. Supreme Court, the Bush administration filed a brief in support of the Sokaogon Chippewa’s right to regulate water purity due to their dependence on Rice Lake and its wild rice beds. In June 2002, the Supreme Court let the lower court’s decision stand, acknowledging the Sokaogon Tribe’s right to require upstream mining companies to effectively guarantee that mining operations will not degrade downstream reservation water quality. Crandon Mine threatened the traditional hunting, fishing, gathering and trapping customs and religious practices associated with the Wolf River area as well as the integrity of Spirit Hill. The project consisted of an extensive underground zinc and copper sulfide mining operation which would have unearthed extremely high concentrations of sulfur waste rock, which ranges from 50-90% pure sulfur. When the sulfur oxidizes in contact with air or water, it turns into sulfuric acid which then leeches out heavy metals in the ore body such as lead, arsenic, chromium and cadmium. Despite plans to use what are presented as the most environmentally responsible extraction techniques, these metals would have inevitably leeched into the Wolf River and the Mushgigagamongsebe watershed. Significant water quality degradation would have been hard to avoid in light of the abundance of hazardous substances in the ore deposit, the sensitivity of wild rice and native fish to copper, and the purity of the water resources surrounding the mine site. Any degradation of these pure waters would be, in the eyes of Sokaogon traditionalists, an unacceptable poisoning of Nookomis oki. In addition to the concern over water quality, the Crandon Mine head frame would have been clearly visible from the Sokaogon reservation above the north slope of Spirit Hill. Thus, when looking at the hill during sunrise ceremonies and other religious events, participants would have seen an industrial mining facility. When speaking to spirits during religious ceremonies, instead of the sound of running water, tribal members would have heard blasting and heavy vehicle traffic. Loss of Spirit Hill as a pristine place would have had serious adverse impacts on the practice of Sokaogon religion. Press release on the purchase of Crandon Mine. U.S. Court of Appeals for the Seventh Circuit decision in September 2001, which upheld the right of the Sokaogon Chippewa to set water standards. “A Final End to Crandon Mine Controversy in Wisconsin?” Mines and Communities, April 6, 2002. Wisconsin Resources Protection Council and the film Keepers of the Water documents the largest, broadest, multi-racial environmental alliance ever formed over a single issue in Wisconsin: the Crandon Mine. Reynolds & Associates a Madison, Wisconsin law firm that represented the Sokaogon Chippewa Community in the water standards case and coordinated the legal and technical strategies on behalf of the Sokaogon Chippewa to stop the Crandon Mine.